Friday May 16, 2014 is National Bike To Work Day! Interested in hosting your own Bike to Work Day celebration at your workplace or bike shop? Register your event here. Get the word out in your workplace or community. 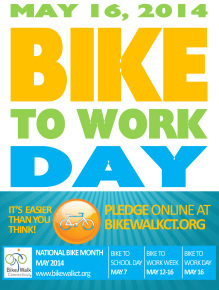 Download this year's Bike to Work Day poster here. If you have a bicycle, you can be a bike commuter. Here are some tips to help you get into the saddle. Want someone to ride with? Check our list of Bike Buddies--there might be someone from your area who's already bike commuting. Now that you are biking to work, why stop there? Bike Everywhere is about using your bike for transportation instead of your car. Think of all the places you can get to on your bike. Bike to the grocery store, the movies, restaurants. Why not? Try the National Bike Challenge to help stay motivated! Can't Bike to Work? Try commuting a different way! Can't bike to work? Then share a ride one day during CTrides Week, May 12-16. Visit CTrides at www.ctrides.com, then take a bus, train, carpool, vanpool, bike, or walk to work. Last year 687 people pledge to bike to work on Bike to Work Day and our estimates are that twice as many people probably participated. Bike to Work Day celebrations were held at 25 locations across the state -- up from 14 in 2012. Some 150 - 200 people attended the Hartford Old State House event alone! Total Miles Ridden One Way, by all pledgers: 4,949. That's a whole lot of savings on gas and emissions! Elm City Cyclists sponsors Bike to Work Breakfasts year round on the third Friday of the month - usually at Pitkin Plaza, Orange Street (between Chapel & Court), New Haven from 7:30 to 9:30 AM. 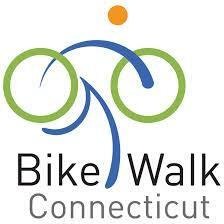 Contact: Elm City Cyclists, emlcitycycling@gmail.com or 203.287.9811. You gotta pledge to win! Pledge to Bike to Work to be entered in the drawing for PRIZES and be counted in Connecticut's Bike to Work Day participation! Promote Bike to Work Day and National Bike Month at your place of employment. Download and print the poster PDF below and share!